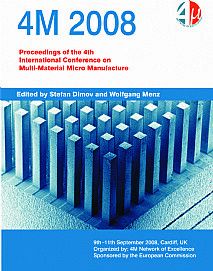 4M 2008, the fourth annual conference of the 4M Network of Excellence (www.4m-net.org), will be held on 9th - 11th of September 2008 at Cardiff, UK. There will be 73 accepted papers including 4 keynote contributors involving more than 200 authors from 16 countries and 46 organisations. This resulting volume details the state-of-the-art regarding numerous aspects of advanced micro technologies with respect to a wide range of materials, and the development of new production platforms for micro systems-based products. The contributions from leading authors from universities, independant research and corporate organizations provide an invaluable overview of this rapidly moving subject and an insight into key research and development areas. This comprehensive collection of indexed and peer-reviewed articles is also contained on a CD with search functionality.